The new book-swap-box at Pathways, a residential setting for people with a history of mental health issues, has proved very popular. 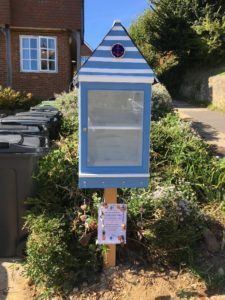 “There has been lots of interest in the book-swap, and we love finding new books in the box and meeting the people using the beach-hut. “The neighbours seem pretty pleased as well. One knocked on the door to tell us she thought the book-swap was the best thing Pathways had ever done for the community, and it showed how well Pathways is run. “We learned lots of new skills including how to drill, how to put in screws, how to paint, how to cement a post, how to make invites and more; these skills with the skills we will gain in keeping the stock fresh and keeping the Community Book Swap going will be valuable to our futures.